The truth is that Fairtrade and certified coffee, chai and cacao are anything but fair, and have never been fair to farmers, farm workers or to their children. Most certifications claim falsely that they are taking farmers out of poverty. They are not. The economic impact of Fairtrade International, the largest certification organization, works out at less than US$0.04 per person per day (calculated using the latest Fairtrade International (2015/2016) report, considering that farmers have five dependants on average). The "premium" of Fairtrade, or certified, coffee, chai and cacao for farmers and farm workers is less than US$0.003 (1/3 of a cent) per cup consumed in developed nations. How can that insignificant amount eradicate poverty? How can anyone, especially any government or state institution, the UN, the EU, OECD, ITC or any other multilateral organization, dare to call that fair, ethical or sustainable? The Oxford English Dictionary defines fair as: Treating people equally without favoritism or discrimination, and uses as an example 'a fairer distribution of wealth'. The Fairtrade or certified coffee, chai and cacao business models were not designed to achieve 'a fairer distribution of wealth'. They were created perhaps with kind intentions to alleviate poverty as an act of charity and through misguided solidarity from the ex-colonial powers to aid the poor suppliers and workers in the former colonies. Max Haavelar was launched in the Netherlands on the 15 November 1988. Respect by the Dutch for the Human Rights of the people in their colonies was anything but exemplary. The same is true for most colonies where Europe profited by creating a vast supply chain based on slavery and exploitative labor. Countries and people they have exploited for centuries with an appalling HCC (Human Cost of Coffee Chai and Cacao) that persists in the form of extreme poverty, high infant mortality, malnutrition, low rates of scholarization, lack of basic services, exploitative wages, etc. Contrary to what consumers have been led to believe by the misleading marketing campaigns of coffee companies, stores, major "charities" (like Oxfam) and even small coffee shops, as well as by major initiatives co-sponsored by the European Union, the governments of several EU nations, led by Germany (where Fairtrade International is based), the Netherlands, Spain and by Switzerland and the United States, so called Fairtrade or certified coffee, chai (tea) and cacao (cocoa), marketed under brands such as Fairtrade, UTZ, Rainforest Alliance and 4C, are not at all fair to producers or farm workers, and even less to their families, according to any dictionary, in any language, nor after any serious economic analysis or detailed scrutiny of their economic and social impact. The net result of Fairtrade & certifications is the concentration of billions of dollars in profits, added value and taxes for developed nations and poverty for most of those certified. The business model of Fairtrade and certified coffee, chai and cacao is to pay a "premium" to farmers and cooperatives after they have paid the cost of certification -it translates into insignificant shared value for producers, farmers, farm workers. It seems clear that Fairtrade and certified coffee, chai and cacao are actually perpetuating poverty. Their failure as systems to eradicate poverty is unquestionable. But it is difficult to question the merit and success of the Fairtrade and certified coffee, chai and cacao marketing campaigns, which have managed to transform consumer goodwill into higher margins for companies and retailers. The market share of only those products certified by Fairtrade International, an organization based in Bonn, Germany, represents more than US$8.2 billion in retail sales according to their latest (2015/16) report. The economic impact on those certified adds up to around US $155 million, less than US$0.04 per person per day, a derisory sum that will contribute nothing to the eradication of poverty. It is time to look beyond the failure of Fairtrade and certifications as a means of eradicating poverty and transfering wealth - they were ill-conceived and cannot be fixed. This is why I have proposed the creation of WeShare, a transparent Shared Value system with compensation for the producers, farmers, farm workers and their families of at least 10CentsPerCup that is consumed in developed nations. That would according to every dictionary be fair, as it would indeed be contributing to a 'a fairer distribution of wealth'. Fairtrade Intl. is a "certification" organization based in Bonn, Germany, that controls the brand and so called standards of "Fairtrade" . It has enjoyed the financial and political support of the German Govt. and of many other EU governments due to its false claim that it can help eradicate poverty by providing small farmers and farmworkers higher incomes and even bring education to rural communities. The truth is that Fairtrade perpetuates a cruel form of "poverty light", due to its insignificant shared value for farmers and even less for farm workers and their families. 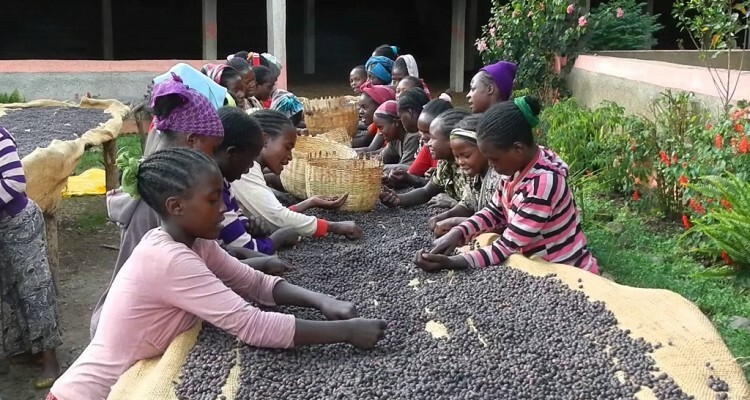 In too many Fairtrade cooperatives less than 5% of girls graduate from secondary school. Only those who do not believe in equaltiy can dare to call certifications fair, ethical or sustainable. In my humble but also firm opinion coffee, chai, cacao or any other product cannot be called FAIR, ETHICAL or SUSTAINABLE until all girls and boys in the communities that produce them have access to secondary school. • Ultimately, the audit regime is 'working' for corporations, but failing workers and the planet. Labour abuses, poor working conditions and environmental degradation within global supply chains remain widespread. • Audits are ineffective tools for detecting, reporting, or correcting environmental and labour problems in supply chains. They reinforce existing business models and preserve the global production status quo. • The audit regime, with the involvement and support of NGOs, is reducing the role of states in regulating corporate behaviour and re-orientating global corporate governance towards the interests of private business and away from social goods.